View of the Forts of Bourbon and Louis on the Caribbean island of Martiniqie. Fort Bourbon was built by Charles Augustin Coulomb between the years 1746 - 1772. The history of Martinique is one of warfare and political upheaval. Discovered by Colombus in 1502, it was claimed by the French in 1635, officially annexed by the King of France in 1674 and then fought over by France and Britain for much of the 18th and early 19th centuries. 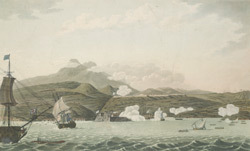 In 1794 English troops led by Sir John Jervis and Lieutenant General Sir Charles Grey, arrived at Martinique. The two forts were the only part of the island not to submitted to them. The ships named the ‘Asia’ and the ‘Zebra’ were ordered to attack and after two days the forts surrendered. This print depicts this very battle.